Trityl group on sulfur is unstable to LiAlH4 reduction. It falls off as triphenylmethyl anion – that’s where the gorgeous blood-red color is coming from. (Unlike trityl cation, which is canary yellow). I did not know about this S-trityl instability – my Greene book (3rd edition) for example mentions only the electrochemical reduction at highly negative potentials – and so I presume it is not as widely known. In my hands, sulfur de-tritylation with LAH happens both with primary and secondary thiols protected as trityl thioethers. The rate of trityl loss seems structure-dependent: metal coordinating groups (such as OH, amino) in the vicinity of sulfur accelerate the LAH-promoted de-tritylation to a point that it cannot be avoided even under mild reaction conditions. In such cases all that remains to be done is completing the de-tritylation by overnight reflux and isolating the free-thiol product from the Al basic salt cake after the usual Fieser workup. The thiol actually ends up stuck within the salt cake as a thiolate; the filtrates contain only triphenylmethane. Trityl-S group seems to be reasonably stable to borane-THF at room temperature. After heating up some simple 2-chloro-4-amino-5-bromopyrimidines with an excess of p-MeS-aniline, I got the corresponding 2-anilino-substituted products – but with the bromine clipped off. The aniline was apparently the reducing agent in this case, producing lots of deep-blue colored oxidized aniline stuff in the process. I suppose it has to do with the chemical similarity of this aniline with the leuco form of methylene blue, a known reducing agent. Beautiful asymmetric transition metal-catalysed chemistry with phosphine ligands chiral on phosphorus dates back to Knowles and Mislow. But these P-stereogenic homochiral phosphines are usualy harder to make, so they were eventually supplanted by ligands with chirality on carbon. As a freshman I used to work for a young assistant prof in Prague – and since I was very interested in asymmetric synthesis, he suggested that I could do a thesis work with him on these ligands; We would put some chiral but racemic phosphine building block onto optically active binaphtyl piece derived from BINOL, and we would get BINAP-like ligands with both axial chirality and chirality on phosphorus. We would then try to separate the stereoisomers and see which one worked better in Rh and Ru-catalysed asym hydrogenations, and we would try to interconvert the stereoisomers to see how the kinetic vs thermodynamic induction control looks like, etc. (Chiral phosphines are conformationally labile on phosphorus above 100C whereas the 2,2′-disubst binaphtyl pieces are fairly stable and should not racemize). This all happened more than 20 years ago and there is over-abundance of commercial chiral phosphines nowadays – though as far as I know the doubly-chiral BINAP idea was never put into practice. The reason why we never managed to put it into practice was that we were inadequate – We did not realise that phosphines are so unstable. Unless in crystalline form or complexed to things like borane, alkyl phosphines oxidise rapidly in air (for example the used silica and eluent has to be deoxygenated)- and we had no glovebox; not even a vacuum/argon manifold line. There is a lovely one-pot procedure for turning triphenyl phosphine into PhePHMe: Sodium metal in liquid ammonia cleaves off phenyls from the phosphines in a controllable fashion. It goes like titration – while you feed the reaction mix with chunks of Na metal, the red color of Phe2PNa develops which then suddenly turns inky blue by the dissolved metal once you reach the equivalence point with 2 equivs of Na. Then you add tBuCl to selectively quench the formed sodium amide followed by MeI, to methylate the diphenyl phosphide anion, and the red color vanishes. Then you add more sodium until inky blue again, quench with solid NH4Cl, evaporate, then distill. The literature procedure has no comments on the smell of these things; I guess a man skilled in art is supposed to know. (We did not). An inorganic chemistry colleague actually warned us about the phosphine stink – he advised us to make these compounds at night (and preferably in a student lab), to use baths of acidified permanganate or bleach or peroxide and decontaminate everything afterwards. It seemed excessive to me but my boss borrowed keys from the teaching lab located at the distant end of a very long hallway, and we went to work there one Spring Sunday afternoon. 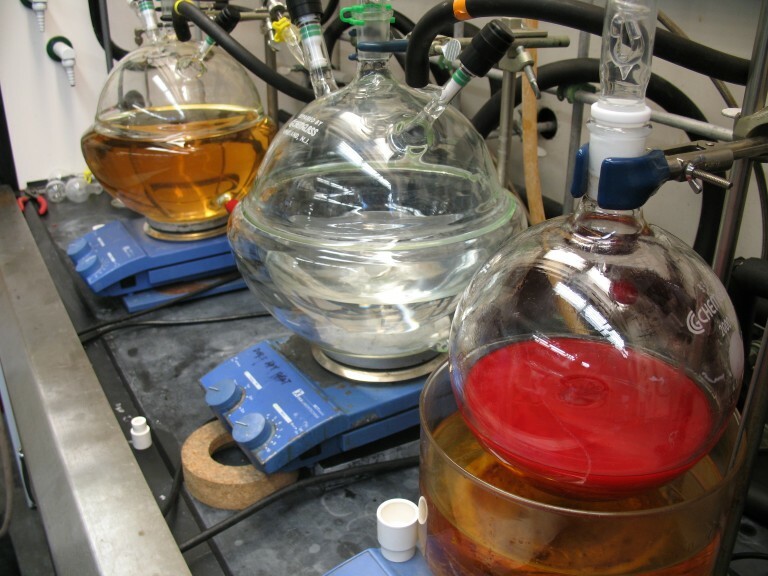 The reaction behaved beautifully – exactly as in literature procedure – the color transitions and all, and even the product distilled pure in a good yield in the end as a highly refractive clear, thin liquid. But the smell – right at the moment when we quenched (in a hood of course) we were pushed back by the solidity of the reek. I got to know many evil chemical smells over the years but nothing comes anywhere close. With the other stinkers, at least one can imagine what sort of unwashed, putrid, fishy, skunky, human-waste object those smells are related to. But I never encountered anything as nauseating or alien like PhePHMe: The memory is stil with me – the most sickly and sweetish smell of rancid gasoline combined with rotten water melons, with undertones of stale sweat, pig carcass, a hint of garlic, moldy oranges, russian-made aftershave and a cheap household air freshener… its a whole package, and rather sweet one – like isonitriles or cyclopentadiene but magnified thousand times. A whiff of that thing and you feel that your nose just suffered a stroke and will hopefully die and peal off so that you never smell that thing again. Inconceivable – and it does not get any better when wearing off; quite opposite in fact – just like with butyric or isovaleric acid, the reek is developing a more alarming depth and complexity with the dilution. Finally, we sealed the product into ampules as to keep it from oxidizing. We washed all the used glassware in permanganate and then in bleach – twice – and we put it on a cart and brought it back to our lab, happily tired after a long and productive Sunday. I remeber that before heading home – as I was putting the glassware on the drying rack above the sink – I noticed a shred of glass from a broken adaptor that remained in a joint of the distillation flask. (I panicked when the thing flamed on me and I broke it). So I dislodged that piece from the joint with tweezers and thew the shred into a glass waste bin next to the sink. It was late night and I did not give it much thought; I did not realise that the broken piece was stuck in the joint and the surface between the two did not get in contact with the bleach bath. I forgot to mention – this old man spent his career on making vinyl sulfur-and-selenium compounds. Forty years – and even he was impressed with our phosphine. Anyway, if you ever consider this carbamate as a modifier for your lithiations, I found a more practical protocol: rather than spooning out a fairly hygroscopic solid lithium salt from a flask and into the LDA solution as described in the publication, I have been preparing and evaporating the reagent into the flask used for the next lithiation step and then transfering the LDA solution to this solid – in that way I was able to run the lithiations on a 250 mmol scale. (Keeping things dry takes more effort here in Florida). I repeated the procedure with Alloc -protected piperidine carboxaldehyde. Without the final mesylation, I got the NH indoline in the incredible yield 37% after some tedious workup (acidic extraction of the product into water etc., then a big column) and the product then crystallized nicely. The final compound was completely inactive in our project. But the joy of spiroannelation – priceless.